any species of the plant genus Oxalis. Most of the cultivated kinds are tropical herbs used as window plants. The leaves are usually cloverlike and respond to darkness with "sleep" movements by folding back their leaflets. (commonly mistaken as clover) An amazing taste treat, very lemony citrus-like flavor that looks like three or four leaf clover with folded leaves and bell shaped pink, violet, yellow or white flower which has 5 petals. The leaves are dull, not shiny and can sometimes be a plum color or green with red around the edges. Wood Sorrel leaves are heart shaped, clover leaves are not, they are oval egg shaped and usually have a whitish line. 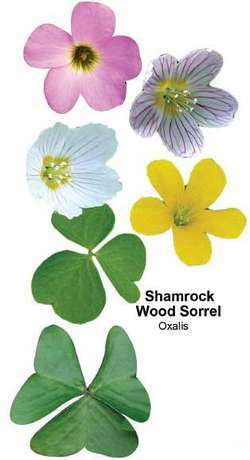 (see diagram) Wood Sorrel has a sour lemony taste, clover doesn't. The wood sorrel seed pods resemble small upward pointing ocra fruits. The stems are fibrous, so most people pluck off the leaves and eat them. The best parts to eat are the leaves, seed pods and flowers. The stems can be used to make tea. The sour lemony taste makes this a great addition to any meal. Because of the high levels of oxalic acid, start by eating a little and building up your tolerance over time. (don’t take if you have kidney issues or stones). Leaves chewed for nausea, mouth sores. Leaf tea used for urinary infections, fever, colds, cleansing blood, gum disease, reduce swelling, soaking tired swollen feet. Makes great lemonade. Other greens to use are sour grass or wood sorrel, chicory leaves, and purslane. Wildflowers include common wood sorrel (Oxalis montana), goldthread (Coptis groenlandica), and partridgeberry (Mitchella repens). 00pm Venue: Minnowburn car park Discover the first flush of flowers adding colour to Minnowburn with lesser celandine, wood sorrel, bluebells, violets and hopefully the yellow primrose among others. org Fabulous fun foraging facts | Wood sorrel, below right, can be used as an ingredient in a tonic thought to cure hangovers. Sitting for hours in front of computers can never compete with showing children the wonder of the seasons, local wildlife, not to mention spring flowers such as wood sorrel, stitchwort and bluebells. To herald the meal's end, a tart green mango sorbet is served with cool cucumber over a gravel bed of nitrogenfrozen wood sorrel that dissipates into perfumed vapor on the taste buds. Perhaps one of the secrets of her success is that Laura likes to use local produce and suppliers and often goes foraging in the countryside for local ingredients such as wood sorrel rosehip flowers, wild rose petals, mallow flowers and wild garlic, which she adds to her modern British fare with dishes such as pan fried king prawns and squid cooked in a spicy peanut sauce, finished with a pomegranate molasses dressing or duck with rhubarb and ginger compote. And it's one that nature has kindly provided - wood sorrel. Banks of primrose, wood anemone, wood sorrel and English bluebell were delightful in the weak sunshine. Besides mushrooms and berries, other delectable forest foods include wood sorrel and dandelion leaves, making a perfect salad, acorns for a decent coffee brew, and rosehip syrup, rich in vitamins. They then jumped back into the car and drove away from the men on Wood Sorrel Road. Known by the common names wood sorrel and shamrock, ornamental oxalis has delicate white or pink star-shoped flowers that peek above shapely green leaves.